Digital Foundry explores the bonus material. Naughty Dog's Uncharted 2: Among Thieves is the game that just keeps on giving. In addition to the gameplay, there's a wealth of bonus material on the disc that is well worth a look. Amongst the various goodies are eight behind-the-scenes mini-documentaries concentrating on the developers and their work. The one we enjoyed the most is entitled "Mastering the Cell", an intriguing glimpse into the ways and means in which Naughty Dog has created what must surely be this generation's defining technical achievement. The documentary is interesting in a number of regards, not least in that it appears that one of the core philosophies behind Naughty Dog's rendering tech is to offload as many tasks as possible from the GPU and stack them up on the SPU satellite processors of the Cell chip. In the case of Uncharted 2, post-processing techniques such as the game's phenomenal depth-of-field effect (pretty much the best seen on console to date) are hived off to the SPUs. It's an intriguing way of using resources. Presumably the GPU would be able to carry out the same task a lot faster, but if the RSX is otherwise engaged in a computationally more expensive task, it just makes more sense to use the SPUs to do the same job. It's a little frustrating to get such a short and often obscured glimpse of the performance tools in action, but at at around 23 seconds into the video, you should be able to discern on-screen that five SPUs are being maxed out: an impressive feat of parallelisation. Other bite-sized snippets of information we learn from this video: firstly, the game appears to be achieving throughputs of up to 1.2 million triangles per frame, effectively 40 million per second. Secondly, some of the debug info shown on-screen is literally quite illuminating - the cascaded shadowmap and translucency lighting elements indicate that transparent alpha effects, such as smoke and atmospheric haze, can be affected by the current lighting scheme. Also worthy of comment as something that's not immediately apparent to the eye, but technically very clever, is the concept of procedural animation, or blended motion. Drake's movement flows more smoothly due to the fact that the game takes its predefined animations and uses the SPUs to figure out intermediate motion to easily move from one to the other without having to wait for a particular animation to complete - this means that the response from Drake to controller commands is that much faster. 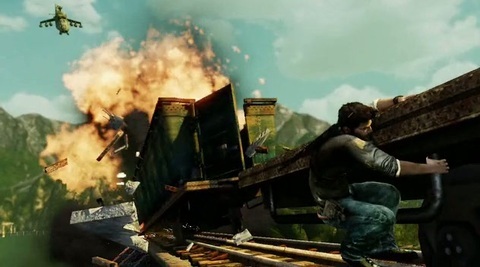 Returning to the here and now, taking a look at this video, particularly after playing through the Uncharted 2 single-player mode, really puts into perspective its landmark technical achievements.